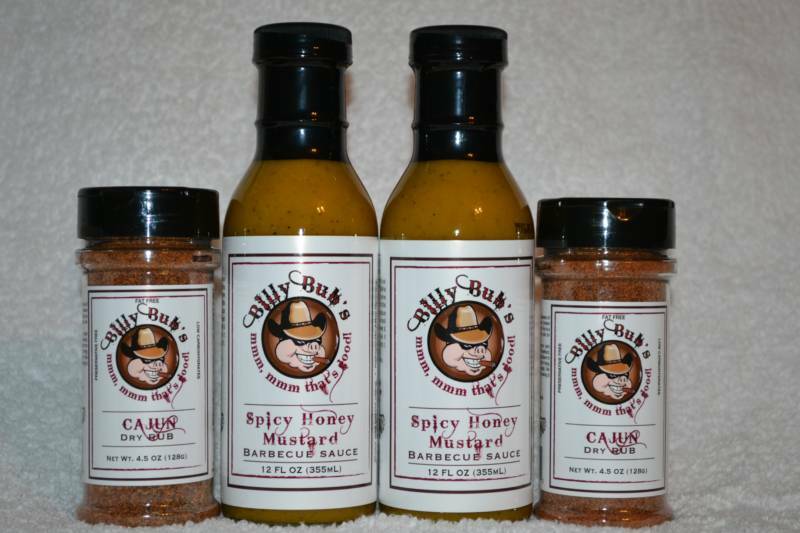 1 bottle of Billy Bub's Spicy Honey Mustard BBQ Sauce - Our South of the Border BBQ Sauce! Great as a mop when your entree is almost done. Great on Chicken (Breasts or Wings) or Pork (Chops, tenderloins or Ribs). Use as a dipping sauce for any BBQ. 1 bottle of Cajun Dry Rub - A Cajun Classic! Great on Chicken Breasts & Wings, Pork Chops & Ribs. Excels on all types of seafood, Shrimp, Scallops, Mahi Mahi, Tilapia and Flounder. Great as a Blackening Rub. Add to flour/batter for frying Chicken or Fish. Rub on for Smoking, Pork Butts, Shoulders, Ribs, Turkeys and Chickens. 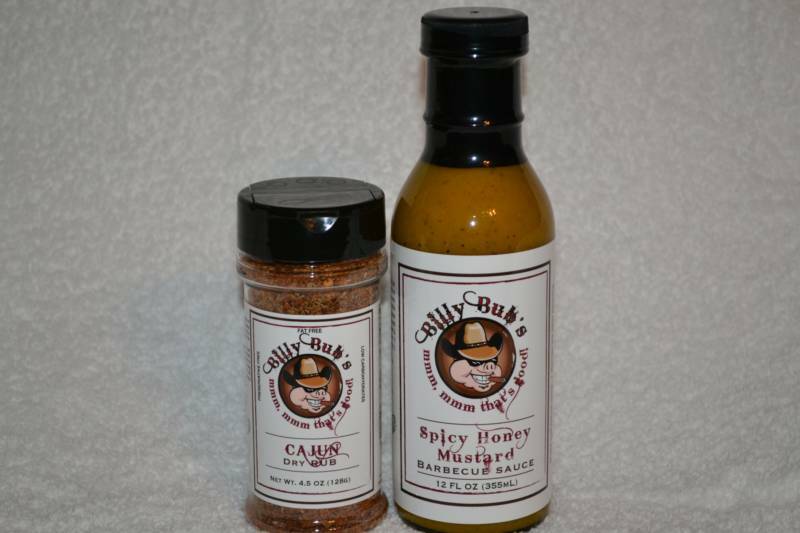 2 bottles of Billy Bub's Spicy Honey Mustard BBQ Sauce - Our South of the Border BBQ Sauce! Great as a mop when your entree is almost done. Great on Chicken (Breasts or Wings) or Pork (Chops, tenderloins or Ribs). Use as a dipping sauce for any BBQ. 2 bottles of Cajun Dry Rub - A Cajun Classic! Great on Chicken Breasts & Wings, Pork Chops & Ribs. Excels on all types of seafood, Shrimp, Scallops, Mahi Mahi, Tilapia and Flounder. Great as a Blackening Rub. Add to flour/batter for frying Chicken or Fish. Rub on for Smoking, Pork Butts, Shoulders, Ribs, Turkeys and Chickens. 1 bottle of Billy Bub's Sweet & Spicy BBQ Sauce - Combines the Sweet taste of Memphis, the Tang of Carolina and the Heat of Texas! 1 bottle of Texas Dry Rub - One Rub to Rule them all! Great for grilling or smoking any meat. 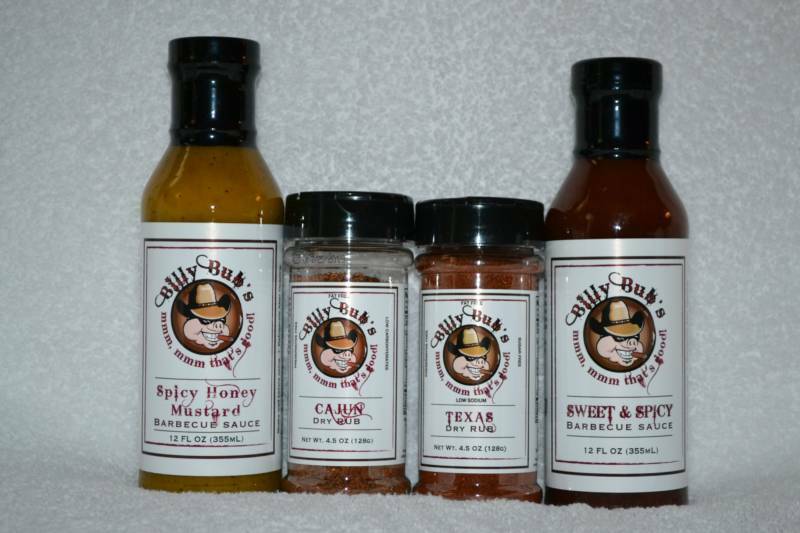 1 bottle of Billy Bub's Spicy Honey Mustard BBQ Sauce - Our South of the Border BBQ Sauce! Great as a dipping sauce for any BBQ. 1 bottle of Cajun Dry Rub - A Cajun Classic! Great for grilling or smoking any meat.